What is Tennis Elbow (Lateral Epicondylalgia)? With the Australian Open officially kicking off and summer bringing it’s A-game, it’s not uncommon to see a surge of friendly social tennis matches happening at the local tennis courts, all across the country. With the increase of tennis being played, there also the increase of the incidence of ‘tennis elbow’ injuries, more medically known as lateral epicondylalgia. What is it? Who gets it? And how myotherapy is great to treat it. Tennis elbow or lateral epicondylalgia is the most common chronic musculoskeletal pain condition of the elbow and can be both extremely painful and limiting. Although not completely confound, it suggested to be caused by overuse, underuse, or constant forces being put on the wrist extensor muscles. The lateral epicondyle of the humerus (the outside of the elbow) is known as the ‘common extensor origin’ to which many of the wrist extensor muscles attach (this is where the pathophysiological name, lateral epicondylalgia arises) so constant shear, compressive and tensile forces in combination of constant use can cause tendon dysfunction, pain system changes and/or muscle dysfunction, all contributing to pain around the lateral epicondyle. 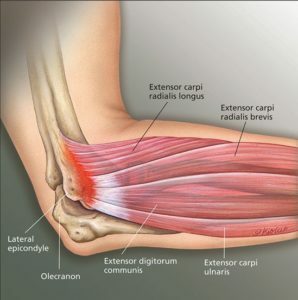 Lateral epicondylalgia, although is very common in tennis player hence the more recognised name ‘tennis elbow’, is an overuse injury that can occur to anyone especially those who have high manual jobs that require repetitive use of the wrist extensor muscles. Around 40% of the population will experience lateral epicondylalgia symptoms in their life but most commonly between 35-54 years old (1). Work that involves constant upper limb movements such as meat processing, factory workers, athletes such as tennis players, boxers, volleyball and even NFL quarterbacks can experience lateral epicondylalgia. Conservative management, such as myotherapy or physiotherapy is always recommended as the first line of treatment. For acute management and decrease of pain around the elbow, manual therapy techniques such as myotherapy to the elbow and wrist as well as oscillations at the cervicothoracic spine may help to reduce pan and increase pain-free grip. With a decrease in pain, it is then recommended to follow a tendon loading exercise program to strengthen the tendon and extensor muscles. Like with any overuse injury however, rest is always a great way to start! Battling tennis elbow? Contact the team at Melbourne Myotherapy and Remedial Massage today.